OK admit it. How many of you have every cheated on a diet? How bad was it? Did you cheat by nibbling on forbidden snacks or did you jump ship entirely? Well our black cat, Johnny Walker, has been caught cheating on his cat weight loss plan! Johnny Walker has a deep dark secret. But first a proper introduction before the scandalous reveal! On a November evening I was feeding the Riverfront Cats. We have a total of three black stray cats--Romeo, Mr. Bear and Midnight. Then this unknown black cat literally walked up to me, looked up like a dog, a person, talked to me, and started whining. "I'm so hungry please, help me. I don't belong here. Someone dumped me here. I'm an indoor cat and these vagrants are attacking me. 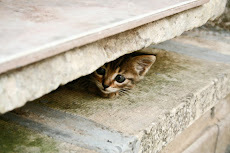 Please, please, please..." (When you work with cats extensively, one learns feline lexicon--I'm not kidding!). 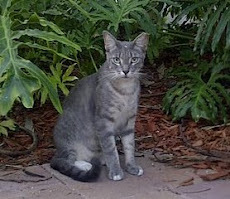 The Riverfront cats did not welcome him as seen by visible signs of scratches on his nose and face. He allowed me to pet him and scoop him up and hold him in my arms and he didn't struggle or scratch. Clearly this was an indoor cat. Considering he was the first all black cat in the household, that he greeted guests like a butler and was not shy of strangers and would sit still on my lap during videotaped interviews, we knew he was a keeper! Even better, Johnny Walker would be the SPOKESCAT for ALL BLACK CATS! 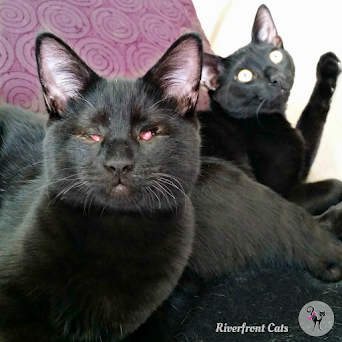 A svelte Johnny Walker with lustrous black cat after several months in new home. Also his first photoshoot. He's a natural ! So what is Johnny Walker's deep dark secret??? He inhaled!!! 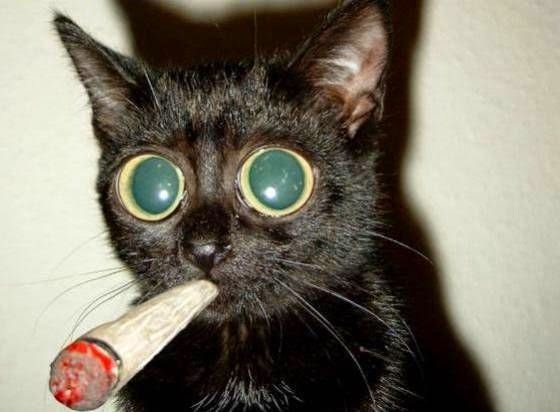 Yes Johnny Walker, a celebrity black cat (or so we like to think) has inhaled marijuana. Well not intentionally. Don't all politicians and celebs take drugs? Perhaps so. Just when this was getting interesting. 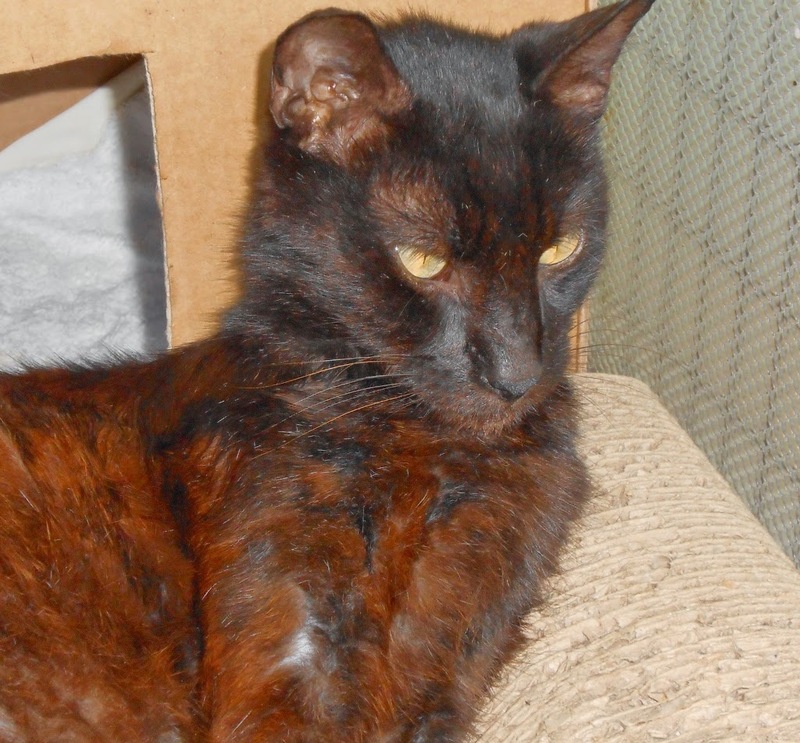 As we posted photos on this blog and Facebook in rescuing Johnny Walker, one resident who stopped by exclaimed--"That is Fred's cat! He dumped the cat outdoors!" Fred was a single guy living in his father's penthouse condo. He adopted Johnny Walker as a kitten (JW didn't have a name) and had to move out and decided he didn't want the responsibility of a pet. Fred apparently spent many days and evenings smoking marijuana that the fumes filled the hallways like chimney smoke. Johnny Walker was svelte and stunning and photogenic (and neutered). He was a born supermodel. The other indoor cats did not welcome him into the fold and to this day treat him as the black sheep. But Johnny Walker knows how to charm any person, family or guest, to give him food. Or he will nibble on your leg to let you know he's hungry. "I guess we're going to be here awhile..."
As time went by and Johnny Walker comfortably settled into his new home, food was his comfort solution. No surprise there. We wondered if the marijuana kept him slender. No drugs in this household. As he gradually gained weight, we knew this was setting a bad example. It was time to take action. 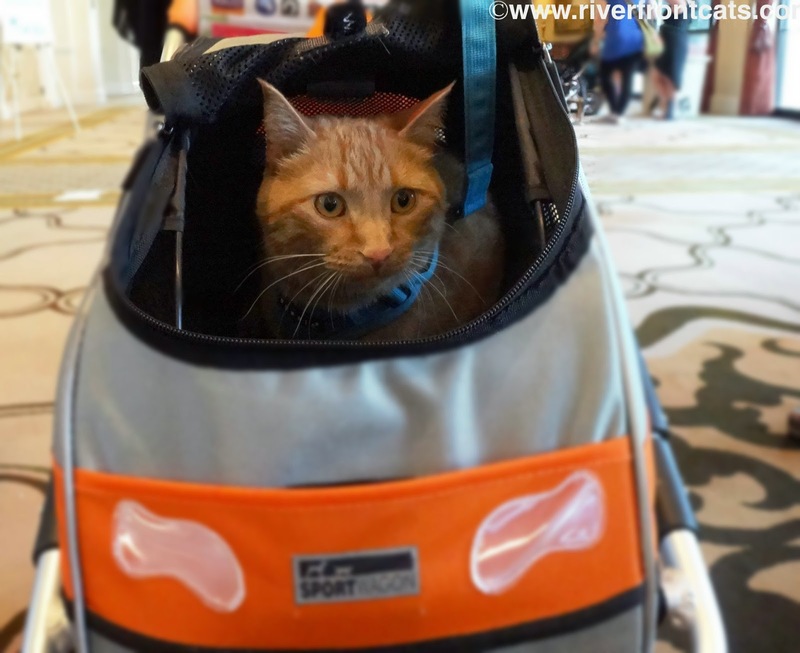 Johnny Walker started the new #HillsPet Metabolic Advanced Weight Solution for Cats in April. The vet indicated he is a large kitty and surprisingly only has to lose two pounds. 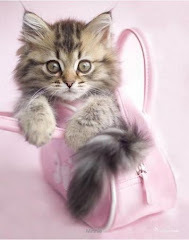 But two pounds on a cat is equivalent to 20 pounds for a human. The battle of the bulge begins. Geisha tries Hill's Metabolic food, now Jean Pierre eats leftovers. Johnny Walker did not hesitate to eat the new Hills Metabolic dry and moist food. He actually prefers it to his old food. The other household cats were jealous and wanted to try it. They loved it! However we recently discovered that another resident cat has learned how to open doors and was Johnny Walker's go- to- cat for midnight pantry snacks. How much did he pilfer and for how long? Only the other cats know and they're not divulging. Cats pact. So has this cat lost weight? 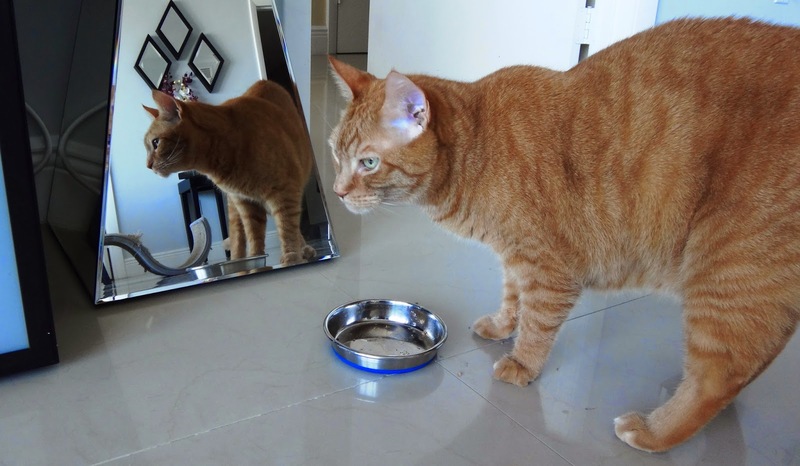 In looking at Johnny Walker and his floppy belly initially we said "no", but based on how loose his diamond collar fits where it easily slides off without undoing the buckle, may be a sign that he is losing weight. Jean Pierre licked bowl clean. He wants more Hill's Metabolic cat food! Stay tuned for the continuation of Johnny Walker's cat weight loss challenge! This post is sponsored by Hill’s. 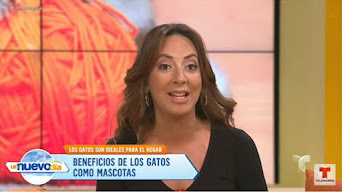 I am being compensated for helping spread the word about Hill’s Prescription Diet Metabolic Food, but Riverfront Cats only shares information we feel is relevant to our readers. Hill's Pet Nutrition, Inc. is not responsible for the content of this article. 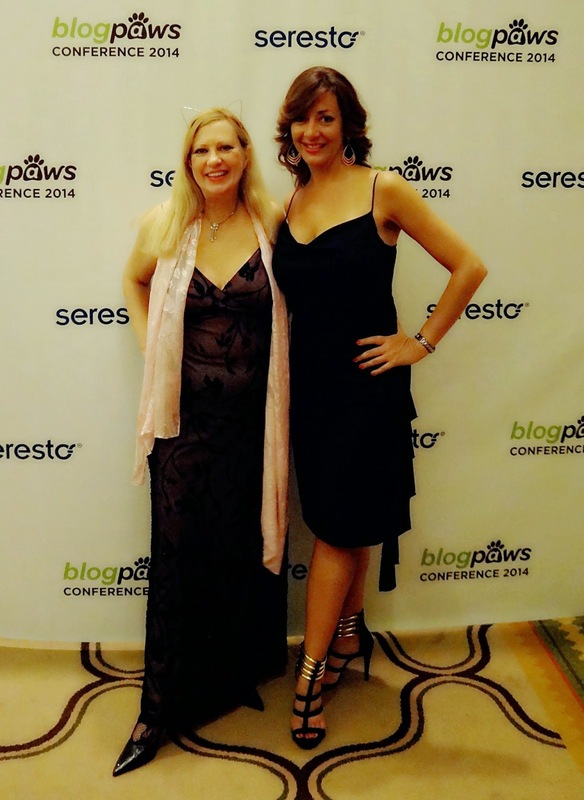 I have just returned from BlogPaws 2014 conference in Lake Vegas, Nevada*. As always I'm buzzing with excitement and ideas. 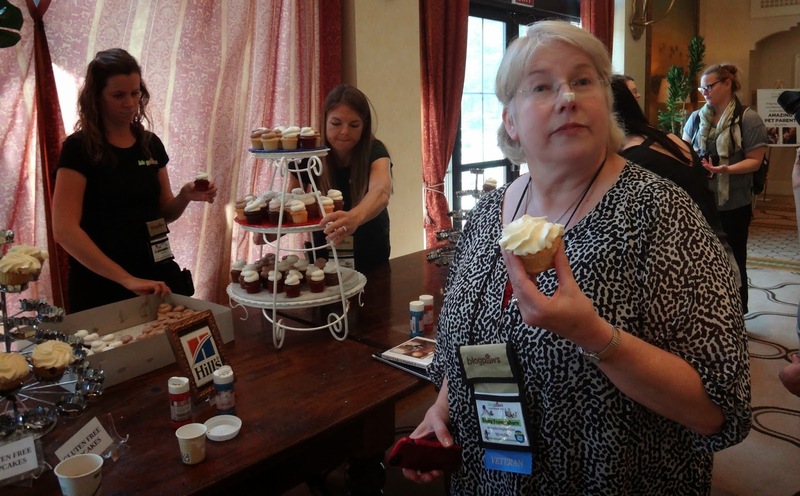 The conference is a welcoming break and getaway to learn new social media trends, reconnect with online friends and cat bloggers, forge new friendships, and simply enjoy a change of scenery. It also recharges my batteries and motivation to fulfill big ideas. 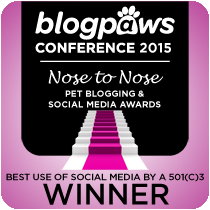 BlogPaws is exactly what it says--a pet blogging conference. This was my third year in attendance but my first year as an award nominee for not one but two awards--Best Cause and Best Video. Many attendees recognized the name and follow my efforts as evidenced in their applause at the ceremony. It is comforting and a motivational boost that my hard work, sweat and tears is paying off. 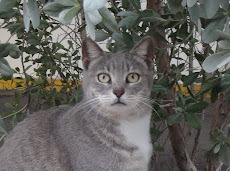 The support of fellow pet bloggers can only mean that each year more cats will be saved from abandonment in the streets, at the pound and from euthanasia. The POWER OF SOCIAL MEDIA! A highlight was the pets in attendance along with their human owners. 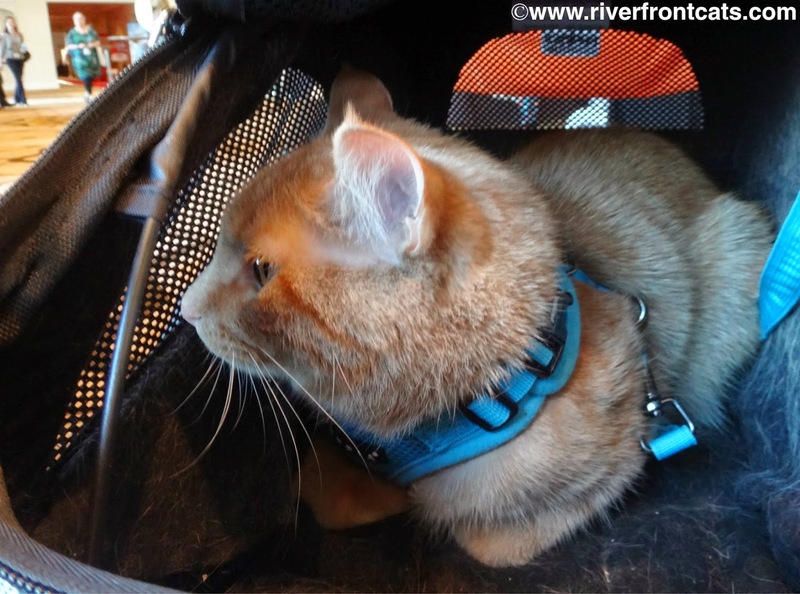 Since this is a cat blog, this review will focus more on the cat stuff, fluff, and furr. 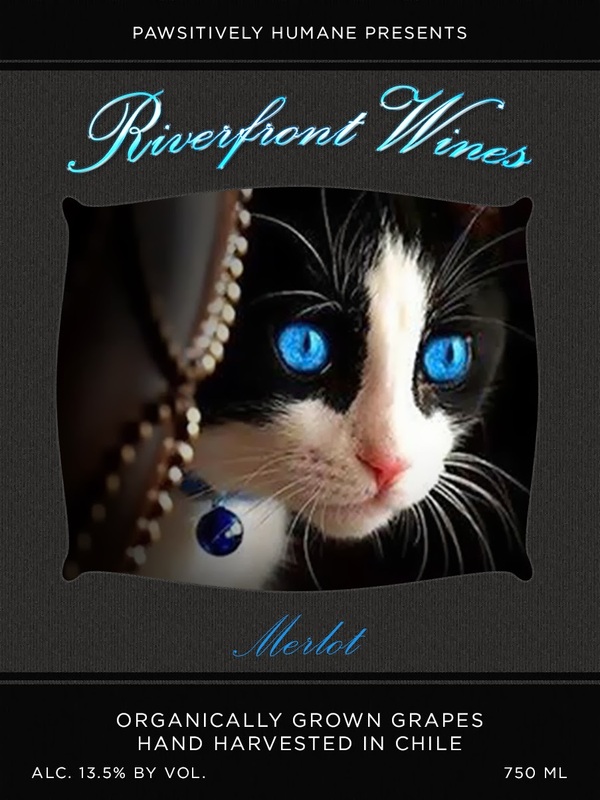 We love our cats so much we blog about them, dote on them, worship them...what better way than with a portrait. Artist BzTat is a huge supporter of animal welfare and specializes in pet portraits both digital and painted that she raffled off 40 digital portraits at the conference! Visit her website to admire her work and contact Bz (aka Vicki) for a personalized contemporary art piece of your beloved furry family member. Networking with key individuals in the industry is important in reaching my goal of raising awareness for homeless, feral and black cats. Pictured below is a dear person who truly loves her job and cares about animals--Olivia Melikhov, the social media manager for the ASPCA. 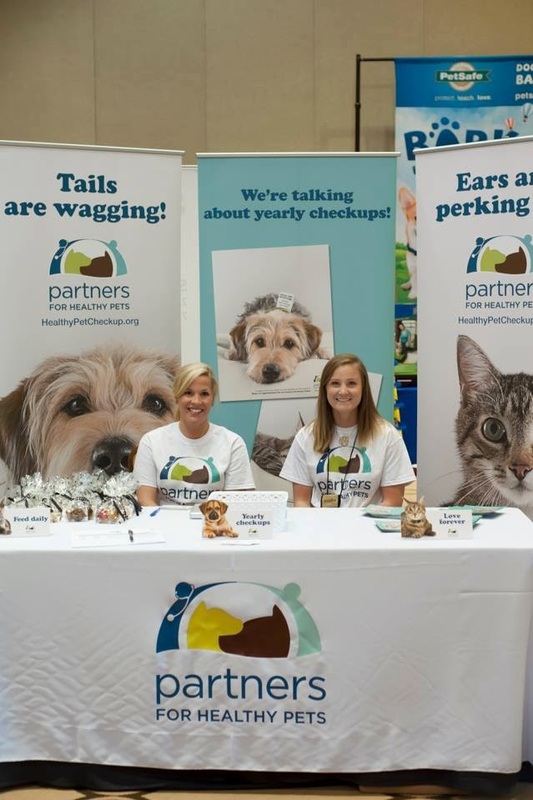 The conference would not be possible without the sponsorship of major brands like Only Natural Pet, Hill's, Pet360, PetSafe, Natural Balance, and AAHA. 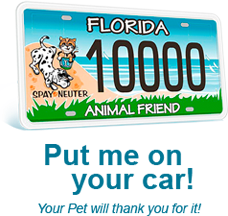 I thank them all for their support to subsidize the majority of costs, which allows bloggers, many of whom do not make money from blogging, to attend, network, learn and advance animal welfare! Petsmart Charities wearing red capes--very snazzy ladies! 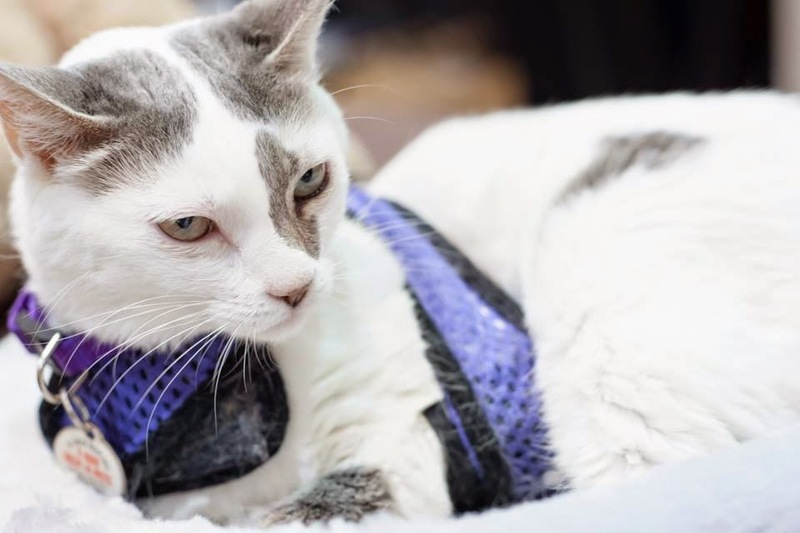 I was impressed that this year Hill's sponsored a number of events including a private luncheon to brainstorm ideas of how to increase adoptions of shelter cats which far outweigh that of dogs. 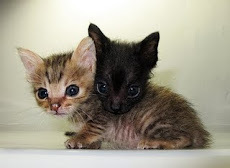 I offered my "proven formula" for getting cats adopted within six months. Paws crossed Hill's can turn it into blueprint for all shelters across the country! 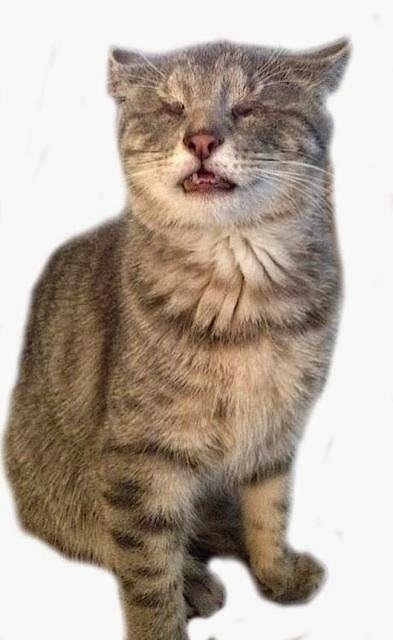 Last year a small BLIND kitten named Odilia stole our hearts. Coincidentally the kind woman who adopted her, was in attendance. When asked how was Odilia her reply "Oh she's a fearless beast!". We love happy ending stories and feed off it to keep moving forward. 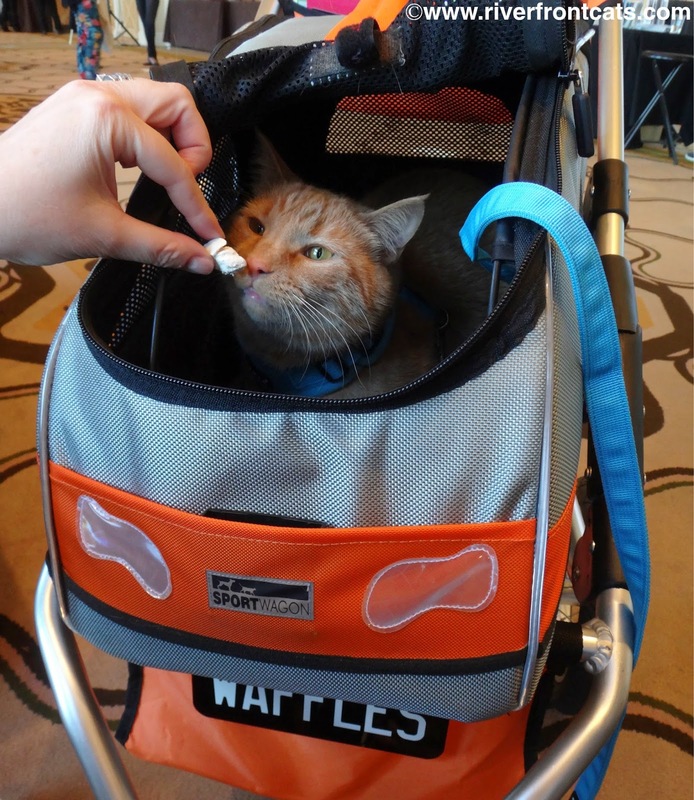 I came across many pets including dogs and cats, ferrets, birds...but word circulated that the famous Waffles (from Glogirly's Katie & Waffles) was in the hotel! You see I harbor a secret crush on this orange fluff ball. Please don't tell Jean Pierre my original orange love, aka "my husband". No one will replace my beloved Jean Pierre. But something about a younger fireball...Could I be a cougar? Calls, text messages ensued and I kept missing the elusive Waffles. Then as I set sail, or should a I say start "rowing" in a paddle boat I received a message that Waffles was making an appearance at the conference--of course now that I was in a bathing suit outdoors in middle of the lake. I hustled back to the beach, (got my workout--thanks Waffles!) and hastily donned my coverup and raced to the conference lobby. And there he was--tucked away in his sporty orange stroller. "Oh no more Catarazzi. Better duck"
With all the paparazzi and attention, sadly I was not able to get a private interview and hug from Waffles. But there will be a next time! I'm sure Waffles looks handsome in a cowboy hat (next year's conference is in Nashville, TN). 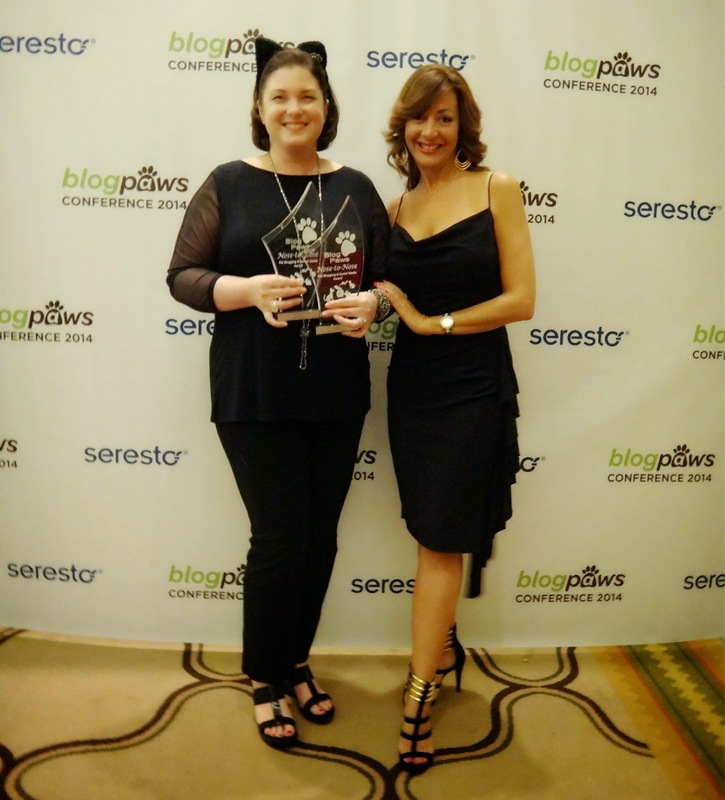 His Human slave, owner, Glogirly (Debbie Glovatsky) won two awards for Best Cat Blog and Best Design Blog. So well deserved! 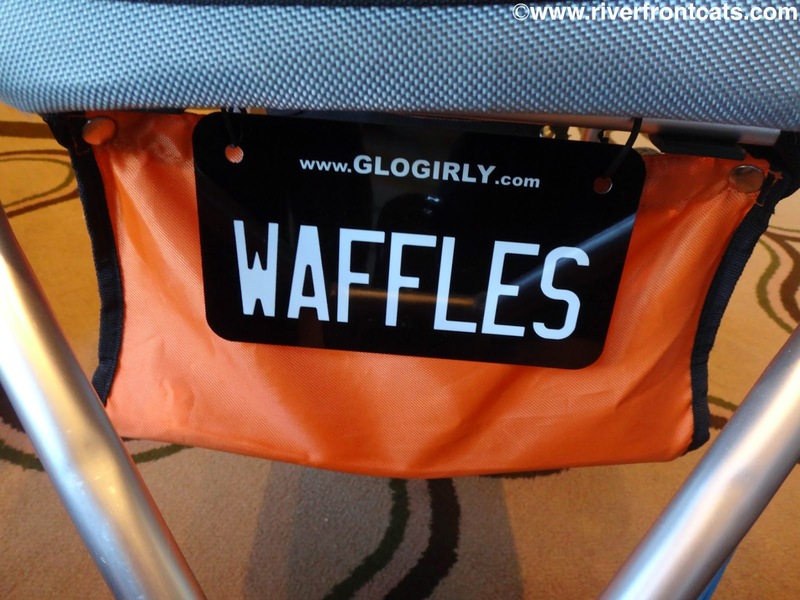 We love her blog and the sibling rivalry antics between Katie and Waffles. 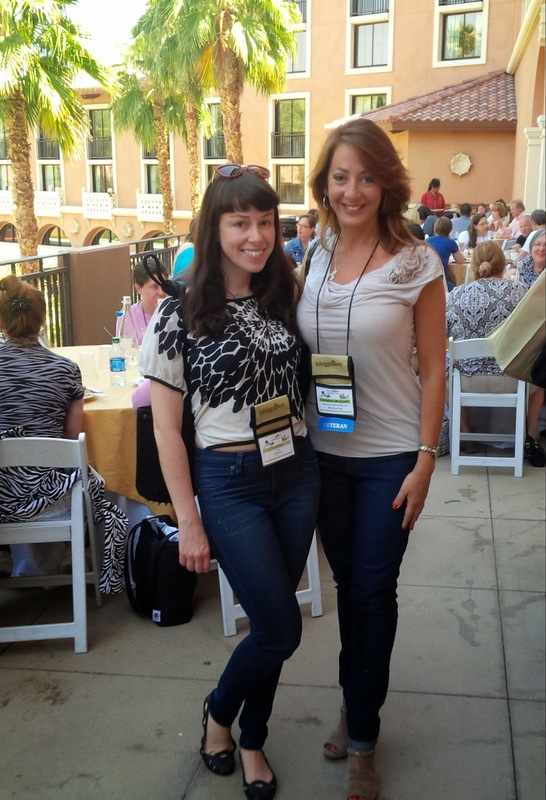 Another highlight is reconnecting in person with online/blogging friends. 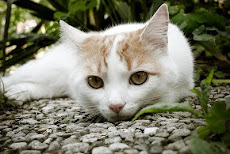 We connect year round online through blogosphere and social media-sphere--Facebook,Twitter, Pinterest...Below are leading cat bloggers in the country. JaneA Kelley (left) from Paws and Effect and Angie Bailey (right) from CatLadyland. 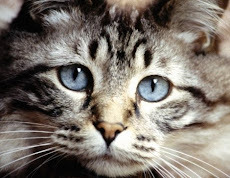 These are pros who know how to write, engage and make a difference in educating about cats!You want to follow their blogs, learn and have a good laugh too!!! 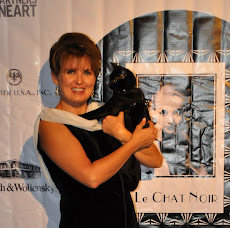 And finally I met the Queen of cat bloggers--Ms. Layla Morgan Wilde from Cat Wisdom 101! 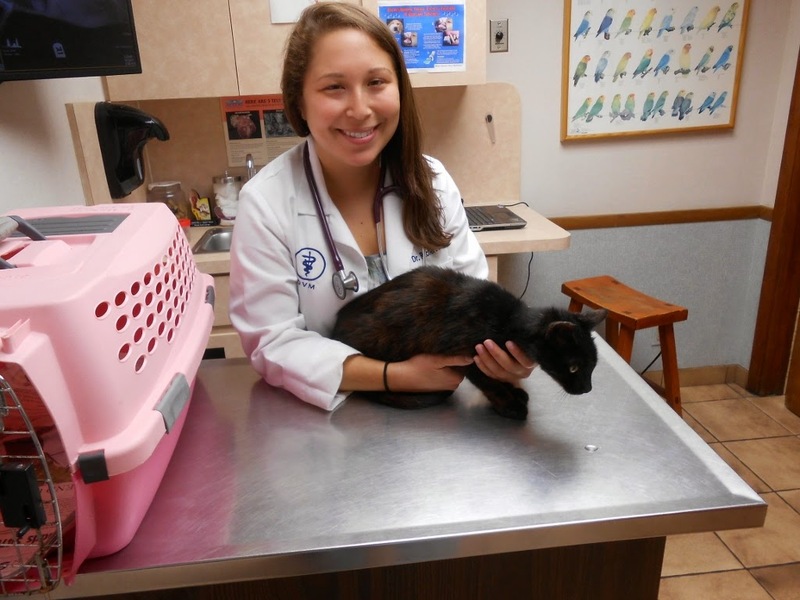 Layla is a holistic cat behaviorist and and has won numerous awards and accolades. I'm so honored to meet and pose with her! Following in these cat steps is no easy feat! 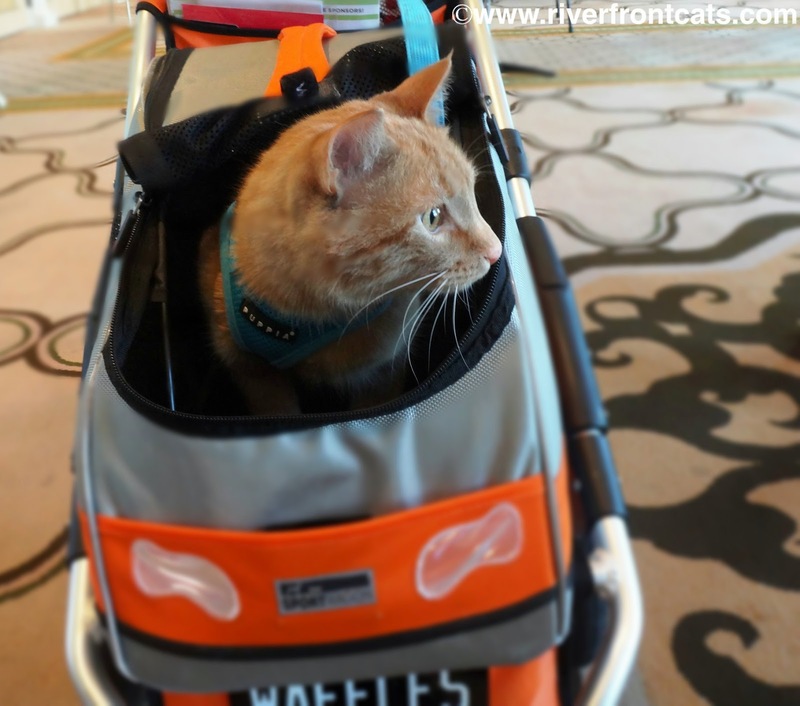 And that's why I attend #BlogPaws--to learn from the best. New friendships were made and unfortunately I could not capture everyone's photo. *Note: While legal to do so, Christine elected to pay for all expenses out of her pocket and refused to use any nonprofit funds. The cats need it more for vet care. 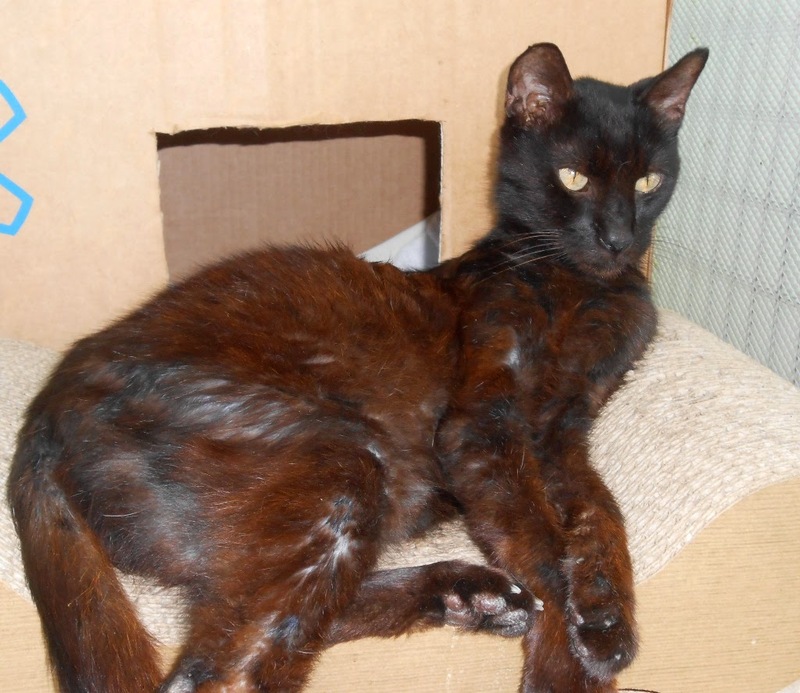 This black beauty is Queenie, with a name like this you must think she was living in a palace. Well, this was sort of her case. This lady in distress was abandoned at The Palace senior living facility in Kendall.She was rescued by our volunteer Christina who immediately took her to the vet. According to the vet she is around nine years old or more. 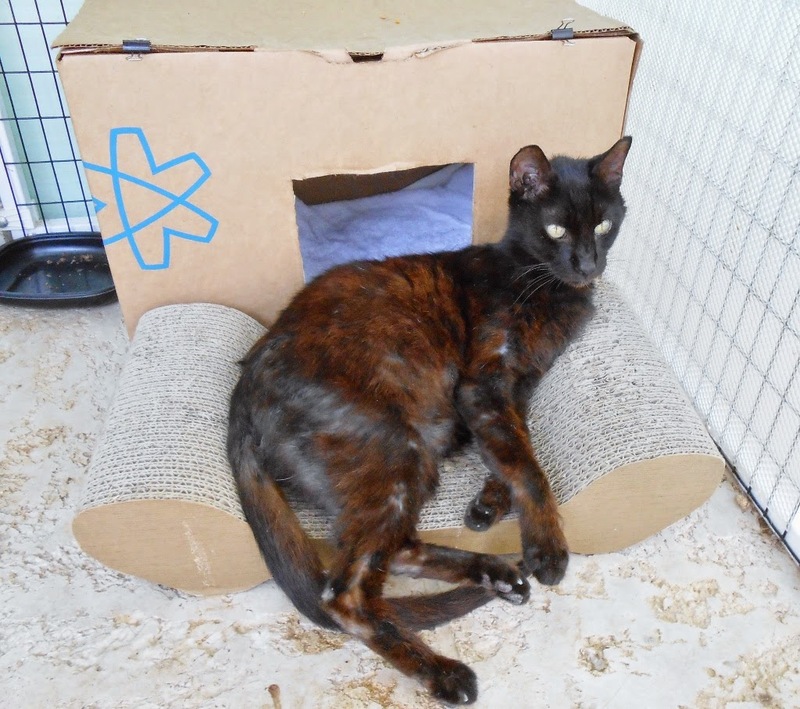 She is very friendly, gentle and is always looking for attention and food which clearly indicates she may have been someone's kitty. However, our friend noticed she was growing weaker and weaker, having to compete with other strays for food, not having access to clean water, and no visible shelter which made her so frail and thin that those who know her started to worry how she would manage in extreme weather. Christina started bringing her food and then finally brought her inside in March in hopes to nurse her back to health. For a over a month, she was doing well. 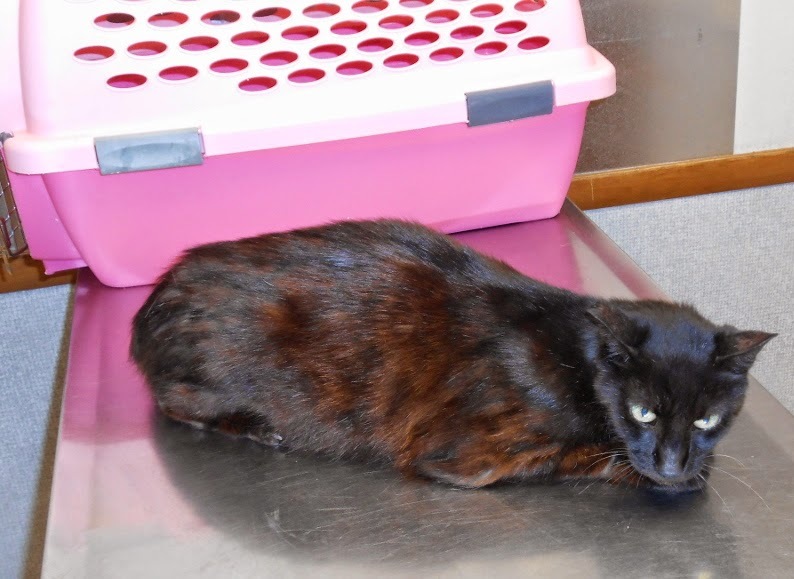 But her tummy is swollen and harder than normal, and then she shows signs of not holding her food down, then stopped eating altogether about a week ago. The vet is diagnosing possible Irritable Bowel Disorder, or intestinal lymphoma, which only an ultrasound and surgery could confirm. 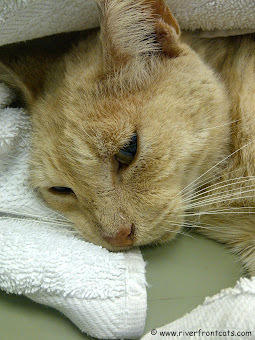 Dr. Donocoff currently has Queenie on Prednisone, Flagyl, and Pepsid. They will hold off on doing the Ultrasound ($390) and exploratory surgery ($638) if she does well on the medication. But a second vet did review her x-ray and fears there may be an obstruction. Her current vet bill is $200+. See below for a copy. 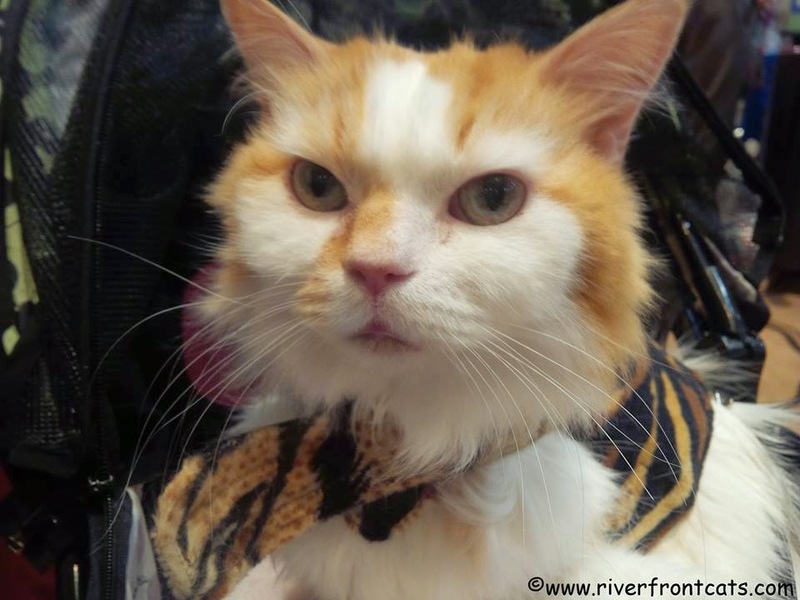 We are asking our dear readers for donations to help us with Queenie's vet bill. Any donation is highly appreciated. $5, $10, $15, $50.